that have low moisture content : lime powder, coal powder, iron powder, coke, aluminum, iron, iron oxide, carbon powder, charcoal powder, slag, gypsum, tailings, sewage sludge, kaolin, activated carbon, coke powder and other powder, powder, waste, waste residue, widely used in refractories, power plant, metallurgy, chemical industry, energy, transportation, heating and other industries. 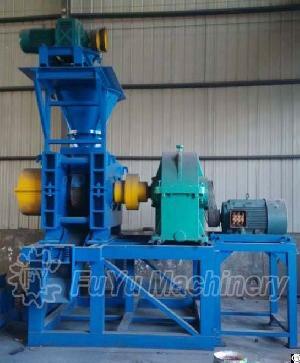 After moulding by ball press machine, the material features energy saving, environmental protection, convenient transportation, improve the utilization rate of waste, have good economic benefit and social benefit. The main motor started, through V-belt, reached to the reducer, through a shaft coupling to the drive shaft by a pair of open gear, ensure two roller axis synchronous ( isokinetic reverse ) which the passive roller is composed of a hydraulic oil cylinder piston ( at constant pressure by the oblique iron counter ), by a hydraulic circuit and hydraulic control valve and the accumulator can guarantee the system pressure, the material from the storage bin through quantitative device evenly into the machine through the hopper, hopper gate regulation, so that the material uniformly into the middle of roller, isokinetic reverse operation to roll compression molding materials single pressure changes from small to big, on roller the center line of molding pressure reaches to maximum, then the molding pressure diminishes rapidly so that the material into the removal of Ball State, smooth off the ball.